Fujioka, K., Kubota, Y. and Takekawa, M. (2018). Wheat Germ Agglutinin (WGA)-SDS-PAGE: A Novel Method for the Detection of O-GlcNAc-modified Proteins by Lectin Affinity Gel Electrophoresis. Bio-protocol 8(23): e3098. DOI: 10.21769/BioProtoc.3098. Diverse cytoplasmic and nuclear proteins dynamically change their molecular functions by O-linked β-N-acetylglucosamine (O-GlcNAc) modification on serine and/or threonine residues. Evaluation of the O-GlcNAcylation level of a specific protein, however, needs multiple and time-consuming steps if using conventional methods (e.g., immune-purification, mass spectrometric analysis). To overcome this drawback, we developed the following easy and rapid method for detection of O-GlcNAcylated proteins of interest. 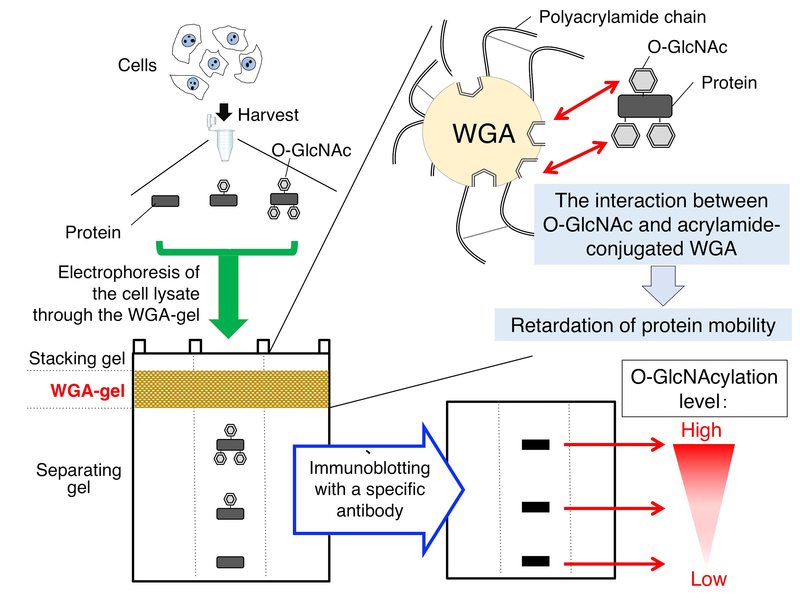 An O-GlcNAc affinity gel layer containing wheat germ agglutinin (WGA), a GlcNAc-specific lectin, selectively induces retardation of the mobility of O-GlcNAcylated proteins during electrophoresis. This WGA-layer thereby separates O-GlcNAcylated and non-modified forms of proteins, allowing the detection and quantification of the O-GlcNAcylation level of these proteins. This new method therefore provides qualitative and quantitative analysis of O-GlcNAcylated proteins in a relatively shorter time compared to conventional methods. O-linked β-N-acetyl-glucosamine modification (O-GlcNAcylation) is one of the known protein post-translational modifications (PTMs) that regulate various properties of proteins such as their stability, subcellular localization, and catalytic activity. O-GlcNAcylation is the result of a reaction in which a single-sugar, N-acetylglucosamine (GlcNAc), is conjugated to the hydroxyl moiety of a serine or a threonine residue of cytoplasmic and nuclear proteins, thereby dramatically altering the molecular functions of these proteins (Yang and Qian, 2017). O-GlcNAcylation is dynamically and reversibly regulated by only two enzymes: O-GlcNAc transferase (OGT) and O-GlcNAcase (OGA) (Hanover et al., 2012; Ruan et al., 2013). OGT catalyzes the addition of a GlcNAc moiety from a uridine diphosphate (UDP)-GlcNAc to target proteins, while OGA removes O-GlcNAc from the modified proteins. Since both O-GlcNAcylation and phosphorylation occur at serine and threonine residues, these two types of PTMs are mutually exclusive on the same target site. Indeed, various cellular proteins have been demonstrated to show dynamic crosstalk between O-GlcNAcylation and phosphorylation (Hu et al., 2010). Despite advances in understanding the importance of O-GlcNAcylation in diverse physiological processes, stoichiometric analysis of only a few O-GlcNAc proteins has been reported. The main reasons for such few reports are the high cost and the time-consuming processes required by conventional methods for quantification of protein O-GlcNAcylation (Rexach et al., 2010; Shen et al., 2012). In addition, the O-GlcNAc moiety tends to be released from the modified peptide in collision-induced dissociation (CID) in mass-spectrometric analysis (Chalkley et al., 2001), which limits evaluation of the O-GlcNAcylation level of a specific protein by using this method. Hence, the development of novel methods for quantitative analysis of protein O-GlcNAcylation remains an important challenge. To overcome this drawback, we have established a novel technique for the separation of cellular O-GlcNAcylated proteins by incorporating wheat germ agglutinin (WGA), a lectin from Triticum vulgaris, into an electrophoretic gel (Aub et al., 1965). WGA has multiple GlcNAc-binding sites (Wright, 1987 and 1992), and the dimerized form of this protein is highly resistant to protein denaturing conditions including acidic environments, chaotropic agents, and high temperature (Rodríguez-Romero et al., 1989; Chavelas et al., 2004). In addition, WGA has been used as an effective tool for the analysis and purification of O-GlcNAc proteins. For example, horseradish peroxidase (HRP)-conjugated WGA can be utilized as a probe to detect O-GlcNAcylated proteins in Western blotting analysis, and a WGA-agarose column can be used for the purification of O-GlcNAcylated proteins from cell extracts (Zachara et al., 2011). Here, we describe a new electrophoretic method, termed WGA-SDS-PAGE, that separates O-GlcNAcylated and unmodified proteins, thereby allowing the detection and quantification of O-GlcNAcylated proteins (Figure 1) (Kubota et al., 2017). Figure 1. Schematic of the principle of WGA-SDS-PAGE. A whole cell lysate contains proteins with different O-GlcNAcylation levels. As the O-GlcNAcylated proteins pass through the WGA-copolymerized acrylamide gel layer, their migration is retarded depending on their O-GlcNAc level because the O-GlcNAc residues interact with the immobilized-WGA. Thus, the higher the O-GlcNAc level of the modified protein, the slower it migrates in the subsequent separating gel. Grow HEK293 (ATCC, catalog number: CRL-1573) cells on a 35 mm dish (2-5 x 105 cells) in 2 ml of DMEM containing 10% FCS, 2 mM L-Glutamine and 100-fold diluted Penicillin-Streptomycin. At 70%-90% confluence, aspirate the culture medium from each well and wash the cells with 2 ml of ice-cold PBS. After aspirating PBS, add 200 μl lysis buffer to each well and collect the cells using a cell scraper on ice. Note: Before harvesting cells, the following chemicals are added to the stock lysis buffer to make the indicated final concentrations: 0.5% DOC; 50 μM PUGNAc; 10 μM TMG; 1 mM PMSF; 10 μg/ml aprotinin; and 10 μg/ml leupeptin. After harvesting, vortex the cells vigorously and centrifuge at 15,000 x g for 15 min at 4 °C and then transfer the supernatant to a new tube. Note: The cell lysates should be stored at -80 °C. Aliquots should be made for multiple assays. Measure the protein concentration of each sample by the Bradford method using the Bio-Rad protein assay kit. Mix 5x SDS-PAGE loading buffer with each sample (about 10-20 μg) to a final 1x concentration. Boil for 4 min at 100 °C and centrifuge briefly at room temperature (R.T.). Transfect pcDNA3 plasmids encoding Myc-tagged proteins into cells using the X-tremeGENE 9 DNA transfection reagent according to the manufacturer’s procedure. Twenty-four hours after transfection, change the culture medium. After an additional incubation at 37 °C for 24 h, wash the cells with ice-cold PBS and harvest them with 200 μl lysis buffer on ice. Centrifuge the cell lysate at 15,000 x g for 15 min at 4 °C and then transfer the supernatant to a new tube. Add 30 μl of protein G-sepharose beads (pre-washed with lysis buffer, 50% slurry) to the whole cell lysate and rotate for 1 h at 4 °C. Centrifuge at 3,500 x g for 1 min at 4 °C and then transfer the supernatant to a new tube. Note: The pre-clearing Steps B4-B5 help to lower the background signal in immunoblotting by depleting proteins that nonspecifically bind to beads. Add 1 μg of anti-Myc antibody to the pre-cleared supernatant and incubate for 3 h at 4 °C with gentle rotation. Add 40 μl of protein G-sepharose beads (pre-washed with lysis buffer, 50% slurry) and then rotate for 1 h at 4 °C. Centrifuge at 3,500 x g for 1 min at 4 °C. Aspirate the supernatant and wash the precipitated beads with 1 ml of lysis buffer containing 0.1% SDS and 0.5% DOC. Note: We usually wash the beads by inverting tubes. Repeat the washing Steps B8-B9 three times in total. Add an appropriate volume (approximately equal to that of the precipitated beads) of water-diluted 2x SDS-PAGE loading buffer to each sample. After vortexing, boil the samples for 4 min at 95 °C and centrifuge at 15,000 x g for 1 min at R.T.
Clamp two glass plates with clips and put in a horizontal position. Note: To confirm that WGA induces the separation of O-GlcNAc proteins, we recommend making a standard acrylamide gel at the same time. To make the 7.5% acrylamide separating gel solution, mix 5 ml of 30% acrylamide solution, 5 ml of separating gel buffer (see Recipes), 10 ml of deionized water, 90 μl of 10% APS and 30 μl of TEMED by gentle inversion. Note: We usually use mini-size glass plates [100 mm (W) x 100 mm (L) x 1 mm]. Pour the separating gel solution (5 ml/plate) between the two glass plates. The height of the resulting separating gel will be approximately 5 cm. Layer water-saturated 2-butanol onto the surface of the separating gel to make a horizontal gel surface, and incubate the gel for about 20 min at R.T. Note: The concentration of acrylamide gel should be selected according to the molecular weight of the proteins of interest. The following website is useful for the decision of an appropriate gel concentration: http://www.bio-rad.com/en-jp/category/protein-gel-migration-charts?ID=N3F3TIDN. After gel polymerization (about 30 min), discard the 2-butanol on the surface of the separating gel and wash the top of the gel several times with deionized water. To make the WGA-polyacrylamide gel solution, mix 0.375 ml of a 10 mg/ml WGA solution (see Note), 0.25 ml of a 30% acrylamide solution, 0.25 ml of separating gel buffer, 0.119 ml of deionized water, 4.5 μl of 10% APS and 1.5 μl of TEMED by gentle inversion. Note: Freshly dissolve the WGA protein (5 mg) in 0.5 ml of 10 mM Tris-HCl (pH 7.5) to give a final concentration of 10 mg/ml. Freezing and thawing of the WGA solution decrease the separation efficiency of O-GlcNAcylated proteins in the WGA-gel layer. Note the concentration of SDS in gels: Under the condition we used, SDS does not greatly affect the binding affinity of WGA to GlcNAc. Pour the WGA-polyacrylamide gel solution onto the top of the separating gel layer (1 ml/plate). Layer water-saturated 2-butanol onto the surface of the solution as in Step C3. Note: The best experimental conditions for the separation of the O-GlcNAcylated proteins tested in this study are a 9 mm-gel length and 3.75 mg/ml of WGA. Note that these values may vary for the separation of other O-GlcNAcylated proteins. After gel polymerization, discard the 2-butanol on the surface of the WGA-polyacrylamide gel and wash the top of the gel several times with deionized water. To make the stacking gel solution, mix 1.5 ml of a 30% acrylamide solution, 2.5 ml of stacking gel buffer, 6 ml of deionized water, 90 μl of 10% APS and 30 μl of TEMED. Pour the stacking gel solution onto the top of the WGA-gel layer (2 ml/plate), and immediately insert a gel comb into the stacking gel solution. The resulting stacking gel will be approximately 1 cm. Note: To confirm the WGA-dependent separation of O-GlcNAc proteins, a standard SDS-PAGE should also be performed using the same samples used in the WGA-SDS-PAGE experiment. The WGA and non-WGA gels can be run in parallel. Load the boiled samples (cooled to R.T.) into the wells of the stacking gel. Note: During electrophoresis, the WGA-layer also induces retardation of the mobility of several proteins contained in commercially available molecular weight markers, probably because of their GlcNAc-modification. Because bacterial cells do not express OGT, bacterially expressed recombinant proteins are not modified with O-GlcNAc. Therefore, some bacterially expressed recombinant proteins, such as GST and GFP, may be able to be used as molecular weight markers in the WGA-SDS-PAGE. Run the electrophoresis at a constant current of 10 mA/gel at 4 °C until the BPB dye reaches the bottom of the separating gel. Note: The running time depends on the concentration of polyacrylamide in the WGA and separating gels. After the electrophoresis is completed, wash the separating gel with transfer buffer for 15 min at R.T. Note: The recipe of transfer buffer is described below (see Recipes). Place two layers of transfer buffer-soaked filter paper underneath the gel, and then a nitrocellulose membrane followed by another two layers of transfer buffer-soaked filter paper on top of the gel. Note: Depending on the molecular weight of the protein of interest, choose an appropriate pore size (0.2 or 0.45 μm) of nitrocellulose membrane. Run the transfer at 4 °C in transfer buffer in the transfer apparatus. Note: It is preferable to use a wet/tank blotting system to avoid heating (at constant-current condition of 0.42 mA for 4 h at 4 °C). Incubate the nitrocellulose membranes with 4% skim milk in TBST (see Recipes) for 1 h at R.T.
Rinse the membrane three times with TBST for 5 min each time. Incubate the membrane in primary antibody solution (1 h at R.T. or overnight at 4 °C with gentle shaking). Note: For detection of protein O-GlcNAcylation using anti-O-GlcNAc antibodies (e.g., RL2), the primary antibody solution must consist of 3% BSA/TBST to avoid increasing the background signal. Incubate the membrane in secondary antibody solution (1 h at R.T.). Visualize the antibody-bound proteins on the membrane by using ECL. Note: Use the appropriate volume of ECL solution according to the manufacturer's manual. Before ECL reaction, extra TBST on the membrane should be removed with paper towel. After incubation with ECL solution, remove the extra liquid as well. 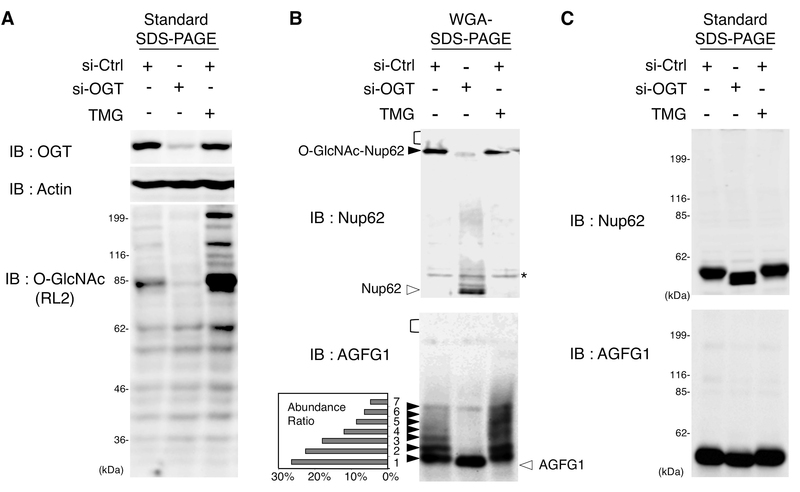 Nup62, a representative O-GlcNAc protein, is observed as a single high molecular weight band near the top of the separating gel in the WGA-SDS-PAGE (Figure 2B, upper panel, lane 1). To confirm that this high molecular weight band indicates an O-GlcNAcylated form of Nup62, we used the cells in which endogenous OGT proteins is depleted by RNA interference (RNAi). Transfection of a synthetic double-stranded small-interfering RNA (siRNA) specific to OGT in cells results in the decreased O-GlcNAcylation of diverse cellular proteins (Figure 2A, bottom panel, lanes 1 and 2). Under this condition, the high molecular weight band of Nup62 is almost completely abolished, and its disappearance is accompanied by the appearance of a lower molecular weight Nup62 band (Figure 2B, top panel, lane 2). WGA-based electrophoresis, therefore, leads to an “upshift” in the migration of O-GlcNAc-modified Nup62 compared to the migration of the non-O-GlcNAc-modified protein. Unlike Nup62, immunoblotting of AGFG1, which is also a known O-GlcNAc protein, shows not a single, but multiple, high molecular weight bands that also disappear when OGT is depleted by siRNA, which results in AGFG1 migration as a single, lower molecular weight band (Figures 2A and 2B, bottom panel, lane 2). Importantly, the higher molecular weight bands observed on the WGA-gel are not observed when these proteins are separated by a standard SDS-PAGE that does not contain the WGA-gel layer (Figure 2C), further indicating that the slower-migrating bands on the WGA-gel are O-GlcNAc modified forms of these proteins. The O-GlcNAcylation levels of specific proteins can be evaluated by quantifying the intensity of the WGA-mediated up-shifted bands. While almost all Nup62 proteins in cells exist as homogeneous and highly O-GlcNAc-modified forms, AGFG1 exists as heterogeneously O-GlcNAcylated forms and only 26% of AGFG1 exists as the non-O-GlcNAcylated form (Figure 2B, bottom panel, lane 1), suggesting that most AGFG proteins are O-GlcNAcylated at multiple sites in cells. The depletion of OGT by RNAi abolishes these up-shifted bands of AGFG1 (Figure 2B, lower panel, lane 2), while the treatment of cells with a potent OGA inhibitor Thiamet-G (TMG), which increases O-GlcNAcylation levels of diverse cellular proteins (Figure 2A, bottom panel, lane 3), enhances the intensity of the upper-shifted AGFG1 bands in the WGA-SDS-PAGE (Figure 2B, lower panel, lane 3). Up-shifted bands are observed when the epitope-tagged O-GlcNAc proteins, such as TFG and UBAP2L are transiently expressed with OGT in cells (Figures 3A and 3B). The combined data indicate that the WGA-SDS-PAGE method can, in principle, detect O-GlcNAcylation of any endogenous or epitope-tagged protein by Western blotting using their specific antibodies, thereby allowing easy evaluation of the O-GlcNAcylation state of a protein of interest. Figure 2. Separation of endogenous O-GlcNAcylated proteins by WGA-SDS-PAGE. A. Increase or decrease of protein O-GlcNAcylation levels in cells. HEK293 cells were transfected with siRNA targeting OGT or with control siRNA and were cultured with or without an OGA inhibitor Thiamet-G (TMG, 10 μM, 24 h). Whole cell lysates were separated using standard SDS-PAGE and analyzed by Western blotting. The O-GlcNAcylation levels of cellular proteins were probed with the O-GlcNAc-specific antibody, RL2. Actin was used as a loading control. B and C. Separation of O-GlcNAcylated proteins by WGA-SDS-PAGE. HEK293 cells were transfected with siRNA targeting OGT or with control siRNA and then were treated with or without TMG (10 μM, 24 h). 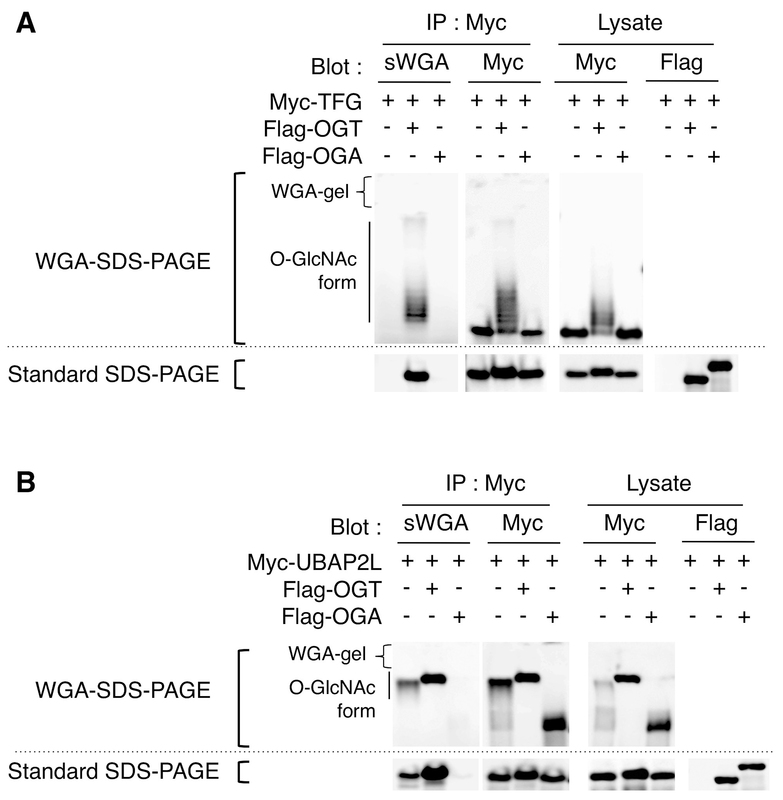 Whole cell lysates were separated on WGA-SDS-PAGE (B) or standard SDS-PAGE (C). Immunoblotting was performed with an anti-Nup62 (upper panels) or an anti-AGFG1 antibody (bottom panels). The black and white arrowheads indicate the O-GlcNAcylated and non-O-GlcNAcylated forms, respectively. The relative abundance ratio of individual AGFG1 forms (No. 1-7) to the sum of all the bands was calculated based on the densitometric data of each band. A black bracket indicates the area of the WGA-gel layer transferred to the nitrocellulose membrane. Actin was used as a loading control. The asterisk (*) indicates a non-specific band. The images are taken from Kubota et al. (2017). Figure 3. Detection and separation of epitope-tagged O-GlcNAcylated proteins. Myc-TFG (A) or Myc-UBAP2L (B) was transiently expressed with Flag-OGT or Flag-OGA in HEK293 cells and was immuno-purified with an anti-Myc antibody. After separation of the purified proteins by WGA-SDS-PAGE (upper panel) or standard SDS-PAGE (lower panel), the proteins were transferred to nitrocellulose membranes and immunoblotted with the indicated antibodies or probed for their O-GlcNAcylation using succinylated WGA-HRP (sWGA). The expression of Flag-OGT and Flag-OGA in cell lysates was confirmed in the standard SDS-PAGE using an anti-Flag antibody. The images are taken from Kubota et al. (2017). This work was supported in part by grants from the Japan Society for the Promotion of Science (JSPS) (16H06574 and 18H02609 to M.T. ; 25650003 and 17K08650 to Y.K.). We thank Dr. P.O’Grady for critical reading of the manuscript. Aub, J. C., Sanford, B. H. and Wang, L. H. (1965). Reactions of normal and leukemic cell surfaces to a wheat germ agglutinin. Proc Natl Acad Sci U S A 54(2): 400-402. Chalkley, R. J. and Burlingame, A. L. (2001). Identification of GlcNAcylation sites of peptides and alpha-crystallin using Q-TOF mass spectrometry. J Am Soc Mass Spectrom 12(10): 1106-1113. Chavelas, E. A., Beltrán, A. P., Pérez-Hernández, G. and García-Hernández, E. (2004). Spectroscopic characterization of the thermal unfolding of wheat germ agglutinin. J. Mex. Chem. Soc. 48(4): 279-282. Hanover, J. A., Krause, M. W. and Love, D. C. (2012). Bittersweet memories: linking metabolism to epigenetics through O-GlcNAcylation. Nat Rev Mol Cell Biol 13(5): 312-321. Hu, P., Shimoji, S. and Hart, G. W. (2010). Site-specific interplay between O-GlcNAcylation and phosphorylation in cellular regulation. FEBS Lett 584(12): 2526-2538. Kubota, Y., Fujioka, K. and Takekawa, M. (2017). WGA-based lectin affinity gel electrophoresis: A novel method for the detection of O-GlcNAc-modified proteins. PLoS One 12(7): e0180714. Rexach, J. E., Rogers, C. J., Yu, S. H., Tao, J., Sun, Y. E. and Hsieh-Wilson, L. C. (2010). Quantification of O-glycosylation stoichiometry and dynamics using resolvable mass tags. Nat Chem Biol 6(9): 645-651. Rodríguez-Romero, A., B., A. and Hernández-Arana, A. (1989). Unusual far-ultraviolet circular dichroism of wheat germ agglutinin and hevein originated from cystine residues. Biochim. Biophys. Acta. 998: 21-24. Ruan, H. B., Singh, J. P., Li, M. D., Wu, J. and Yang, X. (2013). Cracking the O-GlcNAc code in metabolism. Trends Endocrinol Metab 24(6): 301-309. Shen, D. L., Gloster, T. M., Yuzwa, S. A. and Vocadlo, D. J. (2012). Insights into O-linked N-acetylglucosamine ([0-9]O-GlcNAc) processing and dynamics through kinetic analysis of O-GlcNAc transferase and O-GlcNAcase activity on protein substrates. J Biol Chem 287(19): 15395-15408. Wright, C. S. (1987). Refinement of the crystal structure of wheat germ agglutinin isolectin 2 at 1.8 A resolution. J Mol Biol 194(3): 501-529. Wright, C. S. (1992). Crystal structure of a wheat germ agglutinin/glycophorin-sialoglycopeptide receptor complex. Structural basis for cooperative lectin-cell binding. J Biol Chem 267(20): 14345-14352. Yang, X. and Qian, K. (2017). Protein O-GlcNAcylation: emerging mechanisms and functions. Nat Rev Mol Cell Biol 18(7): 452-465. Zachara, N. E., Vosseller, K. and Hart, G. W. (2011). Detection and analysis of proteins modified by O-linked N-acetylglucosamine. Curr Protoc Mol Biol Chapter 17: Unit 17.6. How to cite: Fujioka, K., Kubota, Y. and Takekawa, M. (2018). Wheat Germ Agglutinin (WGA)-SDS-PAGE: A Novel Method for the Detection of O-GlcNAc-modified Proteins by Lectin Affinity Gel Electrophoresis. Bio-protocol 8(23): e3098. DOI: 10.21769/BioProtoc.3098.